"And for that, you will all pay." ...We're baaaaaaack. And ladies and gentlemen, we have a new big bad. With almost everyone running in different directions a lot happened this week. Cami is hiding from Finn. Finn is busy diving into character development (finally!) and his long awaited rebellious stage. Rebekah is tied down in the looney bin while unwittingly bonding with her long lost sister. And Hope is just as adorable as ever. Let's talk about this forced bonding experience between the werewolves and vamps. It bothered me. And here's why. Simply trapping them together should've been enough to prove Finn's point if there was truth to his madness, but it wasn't. He had to go the extra mile to put them at each other's throats by spelling the vampires into literally going for the werewolves' jugulars. Word of advice... if you have to magically change the will of a group of people to prove your beliefs about them, then you are probably wrong. With that aside, I am finally excited about Finn as a character. He has always been such a one-dimensional Mama's boy. I think getting to know him outside of Esther's shadow opens up so many possibilities for him. Also, his little rant to his incoherent parents about them ruining the perfect family of four by having more children was both funny and believable. Elijah is still reeling from his time with Esther. This is the second time he seemed to lose control of himself immediately after staining his outfit. We always knew Elijah was the prissy sibling, but this is just taking it to a whole new level. Klaus suggesting he talk to Cami about his troubles was kind of cute. Is she officially the resident therapist now? If so, she will be quite busy, but she should step up her booze and board games stategy. It should also be noted that Klaus spilling his inner thoughts to Cami is how the writers reminded us where everyone stood. Kol, Kol, Kol... I don't understand how he thought he would get away with his Rebekah switcheroo. I'll be honest, I wondered how Klaus and Elijah would react when they found out. I thought it might piss me off if they forgave him easily and was actually happy when Klaus turned on Kol. Let's hope Kol figures out a better barricade situation than that chaise lounge chair. Are we really supposed to just accept that Freya was taken in a different country centuries ago and just so happened to find herself in a glass coffin in a witchy sanitarium in New Orleans without Klaus or Elijah's knowledge? A sanitarium that Klaus just so happened to curse. It was a good episode, but not without some problems. Gonna set your flag on fire sounded like song lyrics to me so I googled it. They are lyrics in an Aaron Carter song? Jackson maybe won 1/2 a point with me this week. I still can't really take him seriously as a Hayley love interest. I'm interested to hear from people that openly dislike baby plots in supernatural shows. Is Hope grating on your last nerve? Kudos to new Rebekah. I was genuinely impressed with how the mannerisms and signature attitude lined up with the Rebekah that we've all come to know and love. Plus she made me laugh a couple of times. When she bit that guy in the neck and realized how disgusting blood tastes and when she couldn't break down the door because of her stupid human strength. Both funny. Under the pillow is a ridiculous place to hide unswallowed pills. Lazy. Are Esther and Mikael really dead? I'm super glad that Josh didn't kill Aiden. 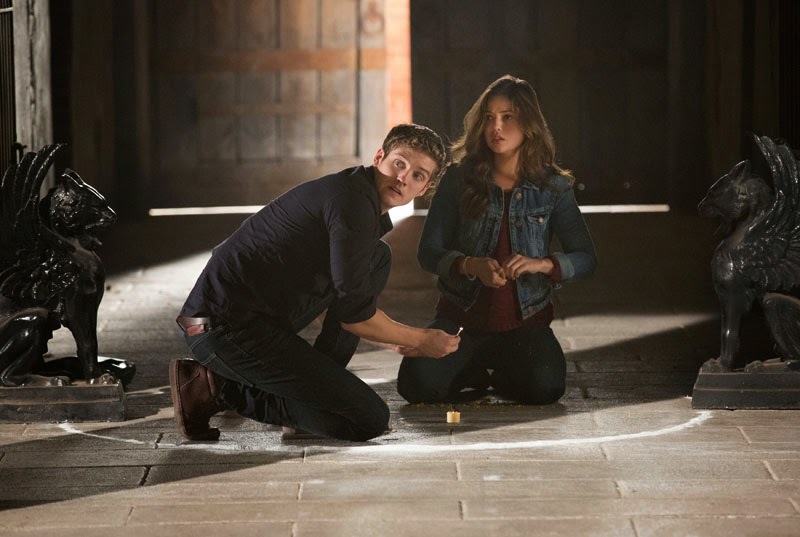 Davina could not be more smitten with Kol. Is ghost Freya's hair in her face because she hasn't been cast yet? Cami: "Right now I'm a little more worried about Finn, considering I totally stabbed him in the back." Elijah: "A single violent outburst at a filthy roadside café, and one never hears the end of it." Klaus: "Well, Cami has a way with minds plagued by demons, brother. You two can bond." Jackson: "I ask you to marry me and you take off for three days. Good thing I'm a secure guy. Sort of." Sounds like this wedding is going to be dragged out for a while. Maybe we'll get some more Haylijah scenes in the meantime. Kol: "Ding dong, the witch is dead. Or undead. Whatever the case may be." I think I made this joke in my last review. Does this mean the writers read my reviews? AND think I'm funny?! Yea, yea. I'll try to stay in reality for the rest of this review. Cami: "Yahtzee! If there's one thing I've learned about you people, it's that there's always a bottle of booze lying around. You want one?" Elijah: "Sounds delightful, and after that Camille will we have another? And another? Perhaps another after that, and before long I'll find myself opening up to you. Unbarring my damaged soul as it were." Klaus: "The truth is it's not love on which the strongest foundations are built. It's the kindness of merciful lies." Finn: "I would've done anything for you. She who gave me life." Finn: "We were a family once. I remember the love between you. How happy you were that I was your son, and I remember the day that we lost our Freya and how we never got that happiness back. I remember it all. It should've stopped there. Instead, you had them. The monsters you call children. And for that, you will all pay." I don't yet have a problem with Freya being in that sanatorium, provided they come up with a really good explanation for it in the future, because currently I think it is supposed to be part of the mystery. This introduction of Freya is clearly a prelude to something larger with Dahlia, and I'm hoping that that something larger will explain why Freya was there. Also, there's more to Finn's forced bonding between vampires and wolves than illustrating a point about them. It's also a strategic move. If vampires and wolves band together and no longer need him and his moonlight rings then he's not only got his siblings to fight but also both of those factions and no werewolf army of his own to fight them with. As such it makes sense to me that even if they didn't start fighting at once, he felt the need to push them over the edge. And I forgot to mention, Mikael certainly isn't dead but Esther might be. When Papa Tunde did the same thing to some random vampires and Rebekah Elijah said that the process of channeling a vampire for power is typically lethal but when used on Rebekah it provided a limitless source of power because as an original she can't die by anything except the white oak stake. Baby plots usually bug me but this one has been well done. It's served to make friends and allies out of Klaus and Hayley, and I really love how Elijah is simply devoted to his niece but doesn't dwell at all on the fact that his beloved gave birth to his brother's baby, something that makes sense for a man as old as he is. I think the new Rebekah is doing a terrific job, too. She acts and sounds like Claire Holt. Oh, and I liked the Freya reveal. Hey, she has to be somewhere, and I imagine that she would be pretty powerful and difficult to contain. It makes sense that she's been, well, contained. You know, I started watching this over Christmas break after going into TVD withdrawals, thinking I wouldn't like it much, since I was never a huge fan of them on TVD. I don't know if its a testament to this show, or how TVD is losing its edge that I was way more excited about this returning from mid-season hiatus. Its definitely more adult than TVD, and I like how they've distinguished themselves completely while using the same universe. That being said, I think that I would like Jackson a whole lot more if he just cut his hair. I agree with the 1/2 point because I think it got a little trim :-) Oh, it'd be nice if he figured out what his accent was. Southern? Whatever it is, it makes him sound dumb, which makes him not an interesting love interest for Haley. So, I'm glad that instead of going the love triangle route, they've gone the Haley is forced to marry him route. I also snorted out loud when Fauxbecca tried to bite the guy and thought it was disgusting. Anyway, I hope they can keep up the momentum. I was ok with new Ester, Finn and Kohl as we'd only seen a little of them (and that was a while ago) on VD. But I don't if I get behind this new Rebekah! I miss Claire!! !